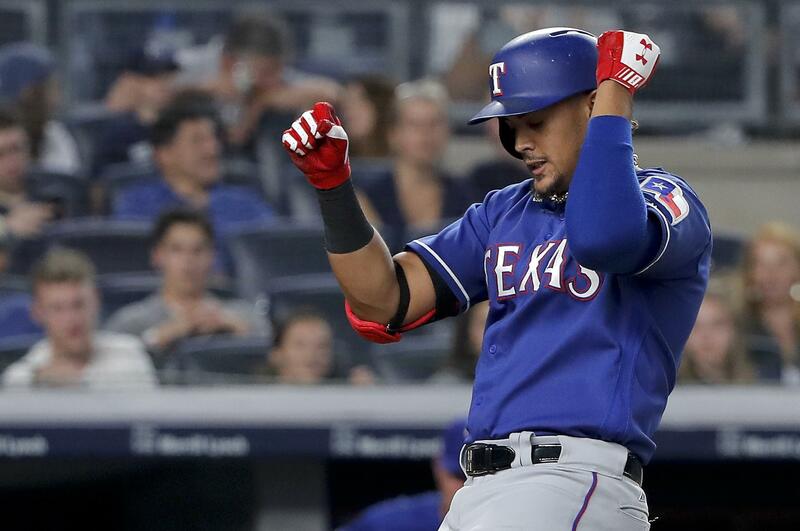 NEW YORK – Ronald Guzman became the first rookie to hit three home runs in a game against the Yankees, powering the Texas Rangers past New York 12-7 on Friday night. Guzman’s two homers off Masahiro Tanaka and one off A.J. Cole made him the first Texas player to hit three home runs in a game since Adrian Beltre in 2012. Mike Minor won his third straight start. Mariners 5, Astros 2: Nelson Cruz hit a tiebreaking two-run double in a three-run eighth inning to lift Seattle past the Astros in Houston. Mitch Haniger doubled with one out in the eighth, and Denard Span singled to chase starter Gerrit Cole. Ryan Pressly took over and his first pitch plunked Jean Segura on the top of his left hand. Cruz then smashed a ball off the wall in left-center to score Haniger and Span and make it 4-2. The Mariners tacked on a run when Segura scored on Kyle Seager’s groundout. Seattle starter Mike Leake allowed eight hits and two runs in six innings. Adam Warren allowed one hit in a scoreless seventh for the win and Edwin Diaz struck out two in a perfect ninth for his 44th save. Red Sox 19, Orioles 12: Xander Bogaerts and Andrew Benintendi each hit three-run homers, Brock Holt connected in a six-run sixth inning and Boston overpowered the Orioles in Baltimore. The Red Sox have won 11 of 13 to open a nine-game lead over the second-place Yankees in the A.L. East. Angels 4, Athletics 3: Kole Calhoun and Justin Upton hit two-run homers, Albert Pujols reached another milestone and Los Angeles rallied from an early deficit to beat Oakland in Anaheim, California. Rockies 5, Dodgers 4: Ryan McMahon hit a two-run homer in the seventh inning after replacing injured slugger Nolan Arenado, Colorado’s beleaguered bullpen kept Los Angeles in check and the Rockies beat the Dodgers in Denver. McMahon entered the game in the fifth when Arenado was taken out with soreness in his right shoulder. Arenado may have tweaked his shoulder while turning a double play in the third inning against Los Angeles. He was covering second base on a play that was scored 3-5-3. Padres 2, Phillies 0: Jacob Nix pitched six strong innings in his major league debut and the Padres beat Philadelphia in San Diego. Nix got off to a rocky start. He stranded three runners after a pair of singles and a walk in the first, and two more runners in the second. Then he settled down, allowing one more baserunner the rest of the game, retiring 11 of his last 13 batters faced and striking out four. Giants 13, Pirates 10: Buster Posey had four hits and drove in three runs as the Giants defeated Pittsburgh in San Francisco. Cubs 3, Nationals 2: Jason Heyward broke up a no-hitter with a tying two-run single in the sixth inning, Anthony Rizzo drew a bases-loaded walk in the seventh and Chicago beat visiting Washington. In the first meeting between the teams since Chicago beat Washington in the N.L. Division Series, the Cubs won even though they didn’t get a hit against Nationals starter Jeremy Hellickson. Rays 7, Blue Jays 0: Blake Snell pitched five perfect innings and then was pulled, Michael Perez hit his first career home run and Tampa Bay beat the Blue Jays in Toronto. Making his second start since spending time on the disabled list because of shoulder fatigue, Snell threw 47 pitches. The All-Star lefty struck out six. Perez, playing in his 10th big league game, hit a two-run homer in the third inning and Ji-Man Choi added a solo drive in the sixth. Both came off Marco Estrada. Reds 3, Diamondbacks 0: Anthony DeSclafani struck out a season-high nine to outduel Clay Buchholz and scored one of Cincinnati’s two runs on Billy Hamilton’s suicide-squeeze bunt to help the Reds beat Arizona in Cincinnati. DeSclafani allowed three hits and no walks while pitching into the eighth inning of his second straight shutdown outing. He limited Washington to one run on six hits with a walk and two strikeouts in seven innings of a 7-1 victory last Saturday. Cardinals 7, Royals 0: Matt Carpenter homered for the sixth time in seven games, Austin Gomber pitched five scoreless innings and St. Louis beat the Royals in Kansas City, Missouri. Carpenter tops the National League with 32 home runs, a .600 slugging percentage and 65 extra-base hits. Carpenter sent a fastball from Burch Smith into the right-field fountains for a two-out, two-run drive. He extended his career high for homers as the Cardinals scored five times in the second. Mets 6, Marlins 2: Zack Wheeler won his fifth straight start, pitching seven solid innings and visiting New York sent Miami to its ninth loss in 10 games. Wheeler allowed four hits and two runs. He struck out eight and walked one. Wheeler’s scoreless-inning streak ended at 23 when he gave up a two-run homer to Miguel Rojas with two outs in the seventh, making it 4-2. Tigers 5, Twins 3: Niko Goodrum and Jose Iglesias homered and Detroit beat visiting Minnesota to snap a six-game losing streak. Jordan Zimmermann gave up two unearned runs on eight hits in 6 1/3 innings. He struck out one batter and didn’t issue a walk. Shane Greene allowed an RBI double to Ehire Adrianza with two out in the ninth before retiring Joe Mauer for his 24th save. White Sox 1, Indians 0: Daniel Palka led off the ninth inning with a home run, Carlos Rodon matched a career high by throwing eight innings of scoreless four-hit ball and the White Sox beat Cleveland in Chicago. Palka launched a 1-2 pitch from Neil Ramirez six rows up into the left field seats for his 18th homer. The shot ended Chicago’s three-game losing streak. Braves 10, Brewers 1: Kevin Gausman pitched eight strong innings to win his SunTrust Park debut, and Ender Inciarte drove in four runs in the Braves’ victory over Milwaukee in Atlanta. Gausman, making his first home appearance since getting acquired in a trade with Baltimore, allowed six hits and no walks, striking out eight and throwing 71 of 94 pitches for strikes. Nick Markakis added three RBIs and Johan Camargo had two, helping the Braves win for the ninth time in 12 games. Freddy Peralta was the loser. Published: Aug. 10, 2018, 11:20 p.m. Updated: Aug. 10, 2018, 11:24 p.m.